Many businesses don’t have enough resources to hire employees who can interact with the customer on phone 24/7 and serving customer satisfactorily pre and after sales is an important business decision. And if suppose you plan to answer the call on your own, it becomes difficult for you to answer every call and solve their query. Now, this problem is not huge which cannot be solved. With an IVR phone system you can attend your customers call in no time and provide every assistance they need. What is an IVR Phone System? 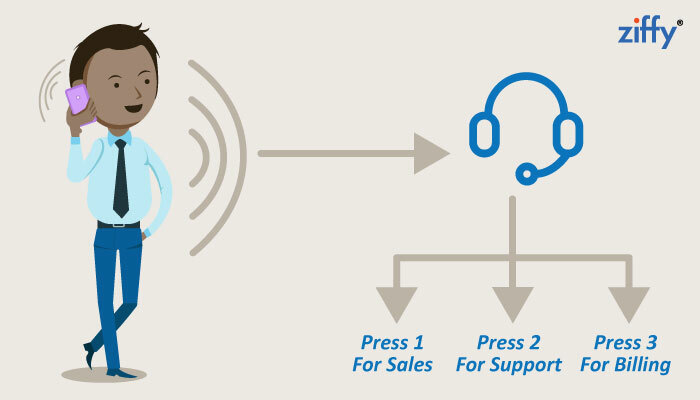 Interactive Voice Response is an automated telephony system that connects with the callers, collect the required information and routes the call to the appropriate recipient. This is a great way through which you can connect to a number of customers in no time and make them feel great. With this system, you can reply your customer through recorded spoken words or generated audio which plays automatically when a caller calls you. How does an IVR Phone System Works? Your IVR system is like the front door of your business. It is the first thing people see about your company and know you through this system. Your IVR should be well scripted and well-versed so that caller doesn’t indulge with problem while interacting. An IVR phone system works by connecting a computer through company’s telephone line. Customer calls you, the call is answered not by a receptionist but by an electronic receptionist. For which, it require a voice behind the phone which is recorded and played when a caller calls the number. IVR : Welcome to ________ Company. Press ‘1’ for English, Press ’2’ for Hindi, Press ‘3’ for Tamil and so on. IVR : Press ‘1’ for Sales, Press ‘2’ for Technical Support, Press ‘3’ for Billing, For more information about our company Press ‘4’. Caller : Presses a number what he is looking for. IVR : Thank you for calling in _______ company. Your call is very important to us. And this ends a call, providing your caller all the relevant information he needed. With a great IVR Phone System, you can able to generate more Leads. Lead generation is demanded by most of the companies and an IVR system helps your business to grow by providing a unique fancy voice which your caller listens when they call you. A good IVR phone system can definitely bring you more business and increases your goodwill. Check out the top 6 reasons that why an IVR phone system leads to growth in business. The business is becoming competitive day by day. The day you start to plan a business, you will see thousands of same companies are already established with the same business. Then, how to survive in the competition? What new things to try to face it? What happens if your phone is switched off and an important phone call arrives? Well, all this can be solved if you have a great interaction towards your audience you can survive even the toughest competition. An IVR phone system helps you in interacting with your customer through a recorded telephone system. And which helps in communicating with the audience even if you are unavailable at the office, or in evening time when the office gets closed. An IVR phone system helps in providing you better customer service. How?? Well, if a fancy recorded voice welcomes your client from the other end of the phone, he will feel that he is being better attended to. In no time the recorded voice gives the reply of the question the customer asks for and making him to build the trust. The reply from the recorded voice is clear and concise which help caller to just follow the instruction and making it easy for both you and your client. Your company’s image needs an upliftment especially if you are a smaller company. An IVR phone system allows your company’s clients listen to a fancy recorded voice which creates a brand image of your company. And also it is not possible for a receptionist to attend all the calls of the caller and making it simpler to attend all the calls. For bigger companies, it fosters a professional image by maintaining the brand that the businessman has established on the long-run. The IVR phone number you are using now is your lifetime phone number. You can move your office to any other location but your phone number remains the same irrespective of where you are located. It is just a one-time investment on your number and there you go, all the year, all the life. Your IVR number will move along your business, no hardware, no software, as easy as your email. A recorded voice does not allow any type of error when your client calls you and makes your client’s call go smooth. Using an IVR makes your call error free when compared to a receptionist. When a number of calls come and your receptionist picks the call, it is natural that your receptionist might forget some information to tell or may not pick all the calls and make callers wait on the phone line but with an IVR phone system, a virtual receptionist picks the call on which the IVR message is recorded and thus making the call error free and go smooth. An IVR phone system makes your customers call easy by making it available to a wider range of audience and reaching out to every single person. If you have your customer worldwide and you talk to them on a daily basis, then an IVR is a great option for you. Use of an IVR can enhance your customer experience by reaching to each one of them. An IVR phone system is definitely a boon to your business leading to growth. It is helpful in enhancing your customer experience when they make a call and also build trust in your company. Make the right move, when choosing IVR phone system !! Also read : 6 Things you should keep in mind to reap the maximum benefit of IVR. Next Next post: Learn the Art of Winning Customer Loyalty with Toll Free Number Services! Nicely written! Good job Tushar! Transformation of IVR is surely promising to be a technology that is to be required by every business.